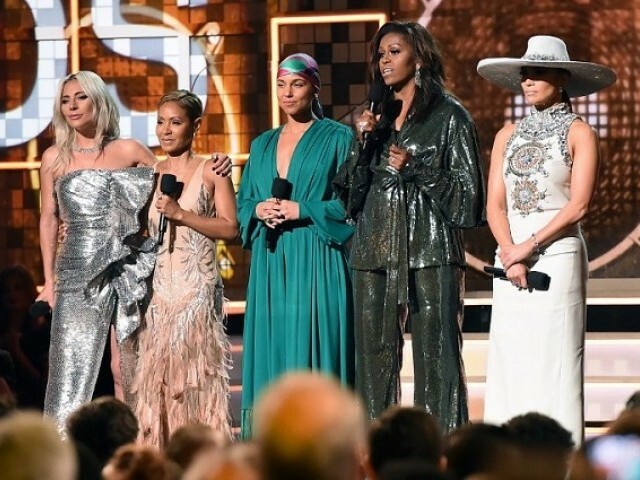 "Music shows us that all of it matter­s, every story within every voice, every note within every song,"
LOS ANGELES: Michelle Obama made a surprise appearance on the Grammys stage on Sunday to deliver a message about music and women’s empowerment alongside superstars Lady Gaga, Jennifer Lopez, host Alicia Keys and actress Jada Pinkett-Smith. “Music shows us that all of it matters – every story within every voice, every note within every song,” said the former first lady, looking glam in a sparkling gunmetal pantsuit with a 1970s-esque wrap jacket. On Sunday, the message was unmistakable – one of diversity.